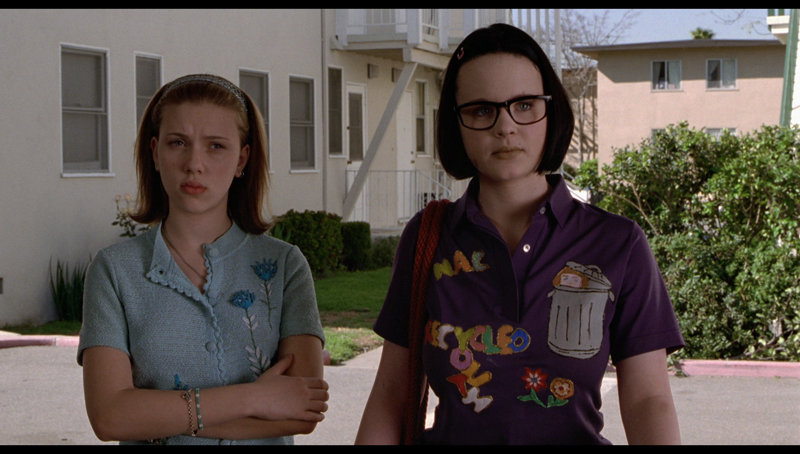 Ghost World is the rare film where the hero and the villain are the same character: Enid, a willfully disaffected high-school graduate without a plan for life, played with a disarming charm by Thora Birch, who had mastered teen angst at the time of the movie. With her dark bob haircut, thick-rim glasses and quirky wardrobe (complete with chunky black lace-up boots), she is the classic ‘90s alternative girlfriend, with the me against the world attitude to match: no one really gets Enid, so everyone is stupid and beneath her, and thus the target for her world-weary barbs, insults and jokes. The only person even remotely on her level--at least in Enid's mind--is her longtime friend Becky, an early role for now-global superstar Scarlett Johansson. Just as languid and sarcastic, Becky has always been the perfect partner in ennui for Enid, willing and ready to whisper judgements and pull pranks on the poor saps who hove into their field of snarky view. Unfortunately for Enid (and for the sake of their friendship), Becky isn't quite as directionless as her pal, and is ready to move on to the next stage of life, including a job and a shared apartment, which her and Enid have been discussing for years, not to mention guys, like Josh (Brad Renfro) the local fella they have been torturously flirtatious with for some time. The resulting tension is just the kind of thing to tear two friends on the verge of big changes apart. Enter Seymour (Steve Buscemi), a geeky middle-aged man obsessed with obscure jazz records and oddball advertising art. Initially the subject of Enid and Becky's taunts, he begins to fascinate Enid, who takes him on like a project, looking to find him a woman, perhaps because she sees something of herself in him, and is trying to convince herself that she won't end up alone if he doesn't. But as she spends more time with him, she starts to become jealous of his would-be girlfriend (Teri Garr), while her focus on Seymour has left Becky by the wayside. Meanwhile, Enid's forced enrollment in a summer art class brings its own set of complications, including the attention of her aspiringly pretentious teacher (played to perfection by Illeana Douglas.) All of these threads cultivate bits of plot that will come to a head in the final third of the film, as Enid has to face the grim reality that she may actually care about something, but, spoiler alert: there's no happy ending for the folks of Ghost World. So much of what makes Ghost World such an outstanding and memorable film, aside from the terrific performances by the cast, including Bob Balaban, David Cross and Dave Sheridan (as a mulleted, shirtless, nunchuk-wielding lunatic) are the aesthetics. For his first feature film, Terry Zwigoff (the documentarian behind the wonderful film Crumb), worked with cinematographer Affonso Beato, production designer Edward McAvoy, art director Alan Muraoka and costume designer Mary Zophres to bring artist Daniel Clowes' comic books to the screen with the same style and idiosyncrasies found on the page (without simply aping his illustrations.) The look and feel is so distinct to these characters and this story (which Clowes co-wrote with Zwigoff, earning an Oscar nomination) that the result is a complete, contained world where anything can and will happen (not unlike Richard Linklater's Slacker) without fear of breaking any unspoken agreements with the audience about the reality of the film. That's important, because the denouement--an exercise in ambiguous open-endedness--requires you to accept a bit of otherworldly happenstance. As much as the climax feels like the end of Donald Margulies's Dinner with Friends, with permanent, yet unsaid consequences looming, what's seen is completely open for interpretation, to the point where two major theories are complete polar opposites and both are completely valid based on the rest of the film. It may be nihilistic, but all that really matters in this film is the here and now. There are no big-picture questions to be answered, no lessons to be learned. People are, people do, people move on. In the end, the hero and the villain both get what they want, as does the viewer looking for 111 minutes of great filmmaking. Ghost World (spine number 872) arrives on one Blu-ray disc in a clear keepcase with a pair of inserts and a double-sided cover featuring new art by Clowes on the cover. The disc art cleverly mimics old-school record labels (like the Paramount LPs seen in the film) right down to "songwriters" and genres. The wonderfully clean Criterion menu provides the choice to watch the film, select scenes and check out the special features. There are no audio options, but subtitles are available in English. The 1.85:1, 1080p AVC-encoded transfer of Ghost World, struck from a new 4K scan of a 35mm interpositive under Zwigoff's supervision, is gorgeous, getting across all the vibrancy that was intended by the filmmakers, without going over a tipping point (though the red graduation gowns early on were a big test.) Comparing this presentation to the the trailer (see The Extras) and the 2002 DVD is like night and day, as you can easily see the difference in the contrast, the fine detail (so much of the background production detail is more evident) and the clarity of the image, which is now free of noticeable defects and digital distractions. Though some of the darker scenes don't have the sharpness of the bright daylight-lit moments, this transfer is an eye-opening delivery of this great-looking film. The 5.1 DTS-HD Master Audio track here is rather low-key for much of the film, with the crisp dialogue mainly heard up front in the center, but when the film's music kicks in, the presence is felt, with the opening (and closing) music setting the tone sonically for the film, while a few other cues (like The Buzzcocks' "What Do I Get") have their chance to take the spotlight. Some crowd scenes (like a gathering at Seymour's) take advantage of the surrounds to fill the space, but for the most-part, this is a subdued, yet technically solid track, which matches the film. "Art as Dialogue" (41:37) which takes its name from Douglas' class in the film, combines new interviews with Birch, Johansson and Douglass to cover a variety of topics related to the film, including what it's like to work with Zwigoff, how they came on board (which involved Christina Ricci), the time of the girls' lives captured in the film, and the various factors that went into making it (like costuming and production design.) Unlike the commentary though, these ladies do talk a bit about what the ending means. Combined with the commentary, this piece gives a nice round perspective on the making of the film. 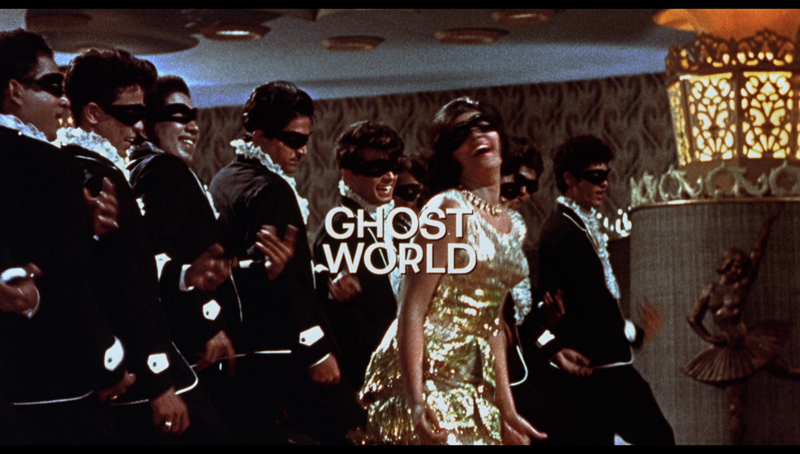 Above any other portion of the film, the piece that every person remembers after having seen Ghost World, is the opening, featuring the song "Jaan Pehechaan Ho" and clips from the song's dance number in the 1965 Indian film Gumnaam. Like the original DVD, this disc has the entire uncut dance scene (5:42) to enjoy--in all its delirious, head-shaking, mask-wearing joy--though now it's in column-boxed HD, and it comes with optional commentary by David Cairns and Stephen C. Horne, as delivered by Roshini Dubey. The track provides background on the original film and song, while also putting the clip in context with the film (as well as with the ‘60s Batman series it's often compared to.) There's even a bit of singing to enjoy, to go along with the many times you'll watch the song and dance number. In the package, we get an excellent 40-page illustrated booklet, which, along with the usual info on the disc and film, includes "Seance in Wowsville", an extensive essay by film writer Howard Hampton, and updated liner notes by Zwigoff from the film's soundtrack, which discuss the selection of the music for the film. The booklet is filled with great photos and illustrations from the film's production as well. Also in the package is a 12-page mini Eightball comic book, which includes the second installment of the Ghost World strip and a follow-up strip from 2008 which looks at what happened to Enid and Becky after Ghost World, a great bonus for anyone new to Clowes' work. 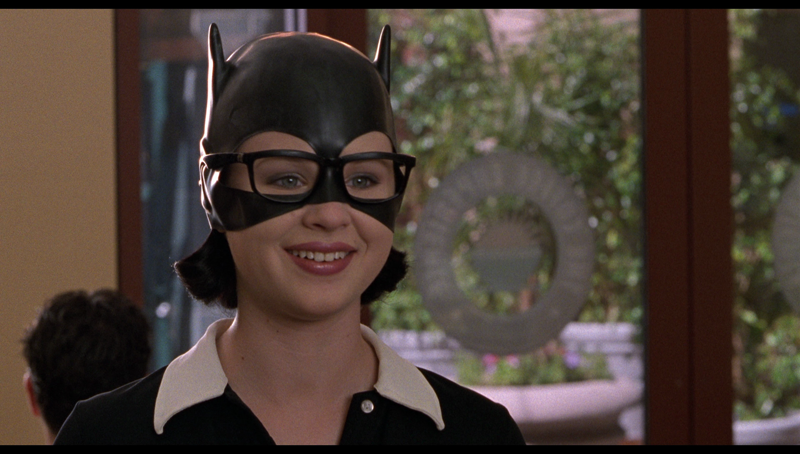 Ghost World is such a precious gem of a film, a self-contained marvel that matches great performances and beautifully creative filmmaking to create something unique and timeless, even while it struggles to give you someone to root for. Criterion has done a fantastic job of bringing the film back with much improved visuals and audio, as well as a terrifically enjoyable and informative slate of bonus content for anyone who enjoys something a little different.